This report contains the full transcript of an interview conducted during October 2010 in Lu Thaw Township, Papun District by a villager trained by KHRG to monitor human rights conditions. The community member interviewed Saw Kr---, a 23-year-old hill farmer from L--- village, Pla Koh village tract, who described an incident where he was injured after stepping on a landmine while on Home Guard duty in Kaw Mu Day, which resulted in him losing his left leg. Saw Kr--- describes how the Tatmadaw deliberately laid landmines on a public pathway, knowing that villagers were likely to tread on the devices. He also mentions that local villagers are active in defending themselves against Tatmadaw troops in Lu Thaw Township, Papun District. This incident is also described in the report Uncertain Ground: Landmines in eastern Burma, published by KHRG on May 21, 2012. The following interview was conducted by a villager in Papun District, and is presented below translated exactly as it was received, save for minor edits for clarity and security This interview was received along with other information from Papun District, including 14 incident reports, 12 other interviews and 82 photographs. Which grade did you study to? I went to school for only two years. How did you get injured by the landmine? I was a gher der [Home Guard]. Where is your gher der [Home Guard] office? Where did you get injured by the landmine? In Kaw Mu Day [village]. How long does it take from Kaw Mu Day to Waw Mu Der [village]? I went there to guide people to Waw Mu Der. Where were the people going? I don't know. They were travelling. Were they crossing the road? Did the SPDC [Tatmadaw] put the landmine in Kaw Mu Day? I didn't know where exactly the SPDC put the landmine. But the SPDC came and put the landmine on the place where the people would walk. So the SPDC didn't walk on the road, they walked beside the road? Yes, they walked beside the road and put the landmines on the walk-way. When did you get your injury? On Friday, after people measured out the paddy. How many home guards went with you? We went with four people [Home Guard members]. Do people rarely use this way? No, people always use this way. How many people walked in front or behind you? Two people walked in front of me. How many people were injured by the landmine? The landmine was very small. It was only the size of two torch lights. Who took care of you after you injured your leg? One of my friends and one villager. They carried me to Plaw Day [village]. One of my friends and one other villager. Where did the other villagers go? Did they carry you? They went in front and carried me for a while. They sent me directly to Ta Ho Der Hospital. Where did you cross the road? Ta Kaw Toh Baw [village]. Where were you sent after you arrived in Ta Ho Der Hospital. They sent me to Day Poo Noh Hospital. How long have you been in Day Poo Noh? How many days after you were injured did you come here? I slept in Ta Ho Der for two days. What will you do after you are given your false leg? I mean, what work will you do? I will farm; I won't be in the home guard anymore. For what reason did you decide to enter into the home guard? The people called. They called another villager but his parent's would not allow it, so they asked me. Everybody has to do this job. Was this a one-year home guard post or a permanent Home Guard post? What will you do after you are cured? I will go back to my village. How long did you work in the home guard before you got injured? Does the SPDC hurt the villagers? 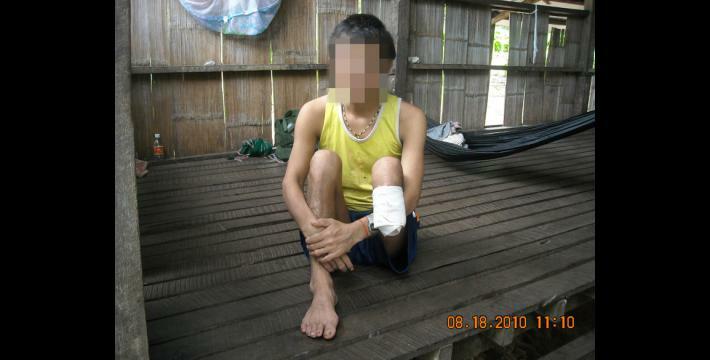 Not only does the SPDC [hurt the villagers], the Karen villagers also hurt the SPDC, to protect themselves. Did anybody get injured before? There are a lot of people who got injured before me. Is fighting inside the country good? Do you want fighting in your country in the future? I don't want fighting. I want it to become good. Do you have anything else you wish to report? I don't have anything to tell. You said after you put your false leg on, you will do what? I will farm and work on hill fields. Do you think it is easy for you to work or run? That is not easy but I want to go and try.